Frequency. In general, if you are a relatively new runner, aim for one speedwork session per week. If you are more experienced, start with one speedwork session per week, but later add a 2nd session, preferably using different speedwork methods. Strides (accelerations): Do these 30-40 second speed accelerations to improve your running economy and leg turnover rate (cadence). They are easy to do and don’t take a lot of time. Start with your warm-up for 10-15 minutes at conversation pace. Then, to do a stride, build your speed for 30-40 seconds, then gradually slow back down to conversation pace. In the first week, add 1-2 of these strides near the end of one of your easy runs, then add another stride each week until you are up to 6-8. This will improve your running efficiency and economy, but won’t significantly improve your overall speed and capacity. These are a good choice if you are a beginner but want to get a little bit of extra leg speed for your race. Incorporate strides for a few weeks before you try one of the other methods below, just to get your body used to running at a faster pace. Hill repeats: Find a hill that takes approximately 30-60 seconds to run up (if training for the 5K) or about 1-2 minutes (if training for the half marathon). For your hill repeat workout, do a 15-20 minute warm-up on flat ground, then do 1-2 hill repeats, running uphill as fast as you can with good form and then jogging downhill. Each week, add another hill repeat to the total until you are at 6-7 total hill repeats. Hill repeats build leg strength, overall speed and aerobic capacity. These are a good choice for a beginner/intermediate runner, especially if you have a history of injuries because this type of work builds aerobic capacity and leg power with minimal impact. (Running uphill is lower impact than running on flat ground). Tempo runs: Tempo runs are longer speed runs done for a sustained period at a somewhat fast, but controlled, pace. Generally, these will be done at a pace that is a bit faster than your half-marathon goal pace. In your first week, do a 10-15 minute warm-up at conversation pace, then do a 15 minute tempo run followed by a cool down. Each week, add 5 minutes to the total until you are at 30-40 minutes. 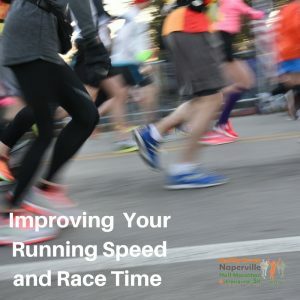 Tempo runs improve your performance at a higher speed with an emphasis on endurance and are a great choice if you are an intermediate runner training for the half marathon. Intervals: These short distance runs, performed at a fast pace with a timed recovery between each one, are done over a measured distance (800 meters is a good distance for most people). Perform them at a pace that is faster than (or right at) your 5K goal race pace. As an example, do your 800-meter repetition, then jog slowly back to the start as your interval (rest period). Start with a 10-15 minute warm-up, followed by 1-2 800-meter intervals, followed by a cool-down. Each week, add another repetition/interval to the total until you are at 5-6 repetitions. This is a good choice for more advanced runners and for advanced 5K runners wanting to improve speed significantly. Don’t do this type of speedwork if you are injured or injury-prone. Shorter intervals can also be done (400 meters or less), but these further increase the risk of injury, so I generally don’t recommend them. Regardless of which method you choose, progress slowly and carefully, and be aware of any unusual aches and pains that develop. When in doubt about whether an injury is brewing, repeat a week before progressing and/or take time off. By carefully using these speedwork methods, you should see improvements in your race times this fall.